The Gauntlet is an interactive accessory designed for a specific application in the field of health and wellbeing: It serves as a therapy device for Carpal Tunnel Syndrome (CTS) which is one of the most common hand diseases. Symptoms range from a burning, tingling numbness in the fingers, nocturnal rest pain, strength loss of the fingers and blood circulation disorders of the hand. The Gauntlet makes CTS patients aware of load situations and reminds them to vary their hand positions: One knitted sensor on the top of the hand realizes if the wrist is bent, another one at the palm and inner side of the arm measures pressure on the wrist. The conductive sensor yarn was knitted as a classic houndstooth jacquard pattern. Different samples for the pattern and prototypes for the gauntlet’s length and cut helped testing different proportions and sensor positions. In combination with black mohair wool and a bouclé yarn, the conductive sensor yarn is brought into line with traditional high quality fashion materials. The soft material furthermore dampens pressure and keeps the hand warm, preventing Carpal Tunnel Syndrome and blood circulation problems. When both sensors scale high values in a continuing stress situation, an integrated speaker on the inside of the gauntlet plays a warning signal. The concealed circuit board also includes a small controller and a Bluetooth module for data transfer to other devices. Connected to a computer, all sensor values can be displayed in a graph on the monitor and the duration of load additionally gets memorized for neurological examination. 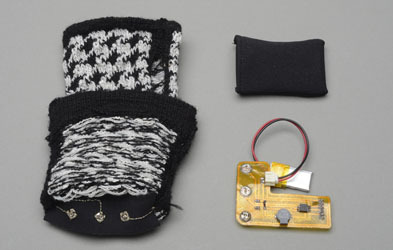 This prototype has been designed as part of the EIT ICT activity “Connected Textiles” in 2013, funded by the EIT ICT Labs consortium. Demo video for the CTS gauntlet. The circuit is attached on the inside of the gauntlet. The sensors are activated when pressure is applied on the wrist. Nathalie Krüger studies Fashion Design at the Berlin University of the Arts.